Our Claire-bug was born weighing 6 lb. 12 oz. 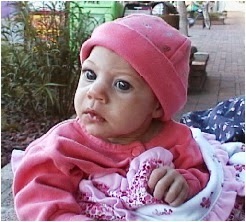 on July 25, 2001 after a normal pregnancy and delivery. Upon her birth, doctors immediately knew she had microcephaly, a condition meaning small brain or small head. We never expected to hear this devastating news, nor did we realize the full extent of Claire's problems until even months later. She was diagnosed at 3 1/2 months of age with MSG -- Microcephaly with Simplified Gyral patterns -- by Dr. William Dobyns (then at University of Chicago), a leading expert on MSG and other similar conditions. This genetic condition is believed to be autosomal recessive, thus having a recurrence rate of 25% or 1 in 4 pregnancies. We were heartbroken initially, as we were told that our daughter might not live to be 1 year old. We still vowed to make our her life (and our lives) the best we could and enjoy every moment we'd have with her. Though she has dwarfism (still undiagnosed... been searching for the gene(s) associated for 15+ years with ZERO matches genetically), Spastic Quadriplegia Cerebral Palsy, epilepsy, scoliosis, a g-tube (feeding tube in stomach), Cortical Visual Impairment (CVI), mitral valve prolapse and other issues, we have chosen not to focus so much on all that is "WRONG" with our child, but instead, we cherish all that our "Mimi" brings to our lives. Her "issues" are normal to us, and we choose to not view them as negatives but instead as just a tiny part of who Claire is. She is an amazing little girl -- stronger than anyone we've ever known! -- and SO MUCH MORE than just the sum of all her diagnoses. August 25, 2016 ~ Taking steps in her walker! 15+ years in the making!!! We have chosen more of an alternative medical route with the girls (see Resources), and while we know this path is not for everyone, it has been wonderful for us and for them. Aside from a hospitalization for Rotavirus and a subsequent visit for a g-tube placement when she was 3 years old, Claire has been very healthy all her life, and for this we are SO grateful! We fully believe that so. much. love. plus her healthy lifestyle has contributed to her longevity. She is fed many fresh, organic, raw fruits and vegetables (thank you, Vitamix Blender!) as well as other natural supplements to optimize her life. We try to remember that her body has the same abilities as ours does to heal, repair, and "do its thing." Some view her life/body as "less than" or as "compromised," but we are 100% convinced that Claire is one of the healthiest, happiest people we know. Despite being very small for her age (24 pounds at age 15!!! WOOHOOOOO! We have fought for every ounce!!! ), Claire has touched so many people's lives and changed ours in a way we cannot describe. She is also a little sister to Cal & proud big sister to Lola, who was born in 2006 with the same genetic condition. July 25, 2016 ~ Age 15! *OCTOBER 2016 UPDATE: We began further genetic testing during the summer of 2016 with hopes that with the increase in technology and the advances in science, we might be able to get answers regarding the girls' condition. We sent bloodwork from all five of us to Christopher A. Walsh Laboratory in Boston to take part in a research study on developmental disorders of the brain. We also visited Children's Mercy Hospital's Genetics Department in Kansas City, Missouri for a clinical evaluation and to begin the process of Whole Exome Sequencing (WES). We were recently notified by Children's Mercy that our daughters now have an official diagnosis! Both girls have a Neuro-Metabolic Disorder known as Asparagine Synthetase Deficiency (affecting the ASNS gene). Both Scott & I are carriers for this gene, and it is autosomal recessive, as expected. This means that we have a 25% chance of this occurring with each pregnancy. It is not more likely to affect our girls, and the fact that our son is neurotypical and the girls are not is simply chance. We are in the process of testing Cal's blood to see if he is a carrier, as he has a 2/3 chance of that occurring. Likely this will not be an issue for him in his life, as this genetic defect is extremely rare. I posted more about our findings in THIS POST, and I hope to update more about this diagnosis very soon. We are so very grateful to Dr. Amudhavalli, Laura & the entire Genetics Staff at CMH for their time and efforts to help us finally get answers, after 15+ years of having none. We also want to thank Jennifer and everyone at Walsh Labs for their continued research on our girls' condition. We could not have asked for a better team to work with across the board. In lieu of flowers (as Lola is allergic to many flowers), memorials can be made to: Night To Shine in c/o the Tim Tebow Foundation and Make a Wish Foundation of Kansas. Share condolences at www.CozineMemorial.com.